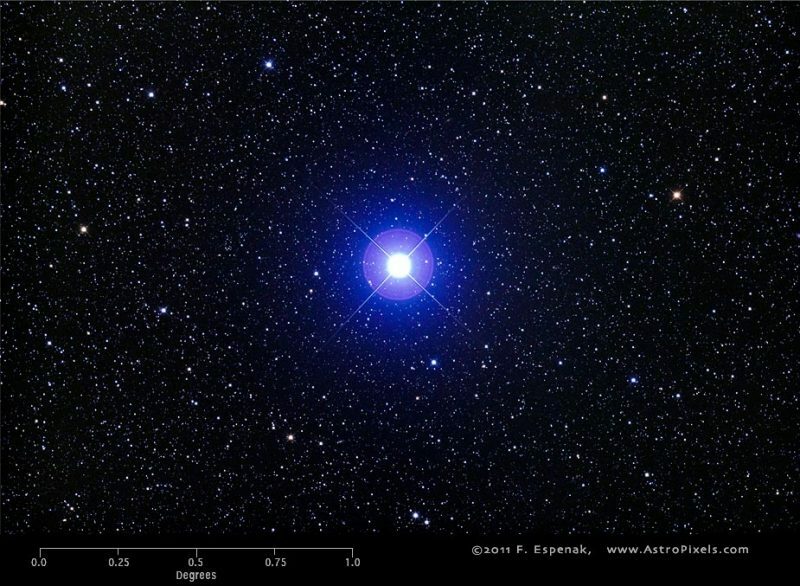 The beautiful blue-white star Vega has a special place in the hearts of skywatchers around the world. Come to know it, and you will see. Vega is especially fun to meet at this time of year, because it plays a key role in the Chinese Qixi Festival – pronounced KEY-she – which takes place this year on August 17, 2018. 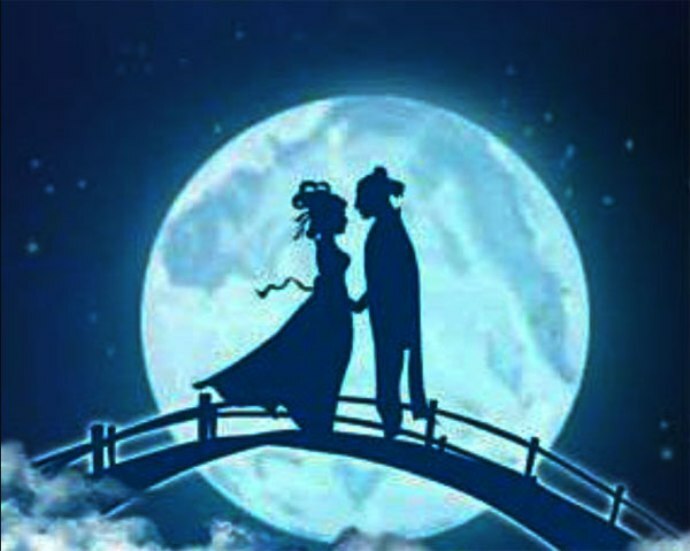 The Qixi Festival is also known as the Double Seventh Festival or Qiqiao Festival. It’s the most romantic of all traditional Chinese holidays, a time to celebrate star-crossed lovers. It takes place every year between July 31 and August 29 on the 7th day of the 7th lunar month. Star-crossed lovers Zhinu – represented by the star Vega in the constellation Lyra – and a humble farm boy, Niulang, represented by the star Altair in Aquila. Image via The NewsTalkers. Vega in history and myth. In western skylore, Vega’s constellation Lyra is said to be the harp played by the legendary Greek musician Orpheus. It’s said that when Orpheus played this harp, neither god nor mortal could turn away. In western culture, Vega is often called the Harp Star. But the most beautiful story relating to Vega comes from Asia. There are many variations. 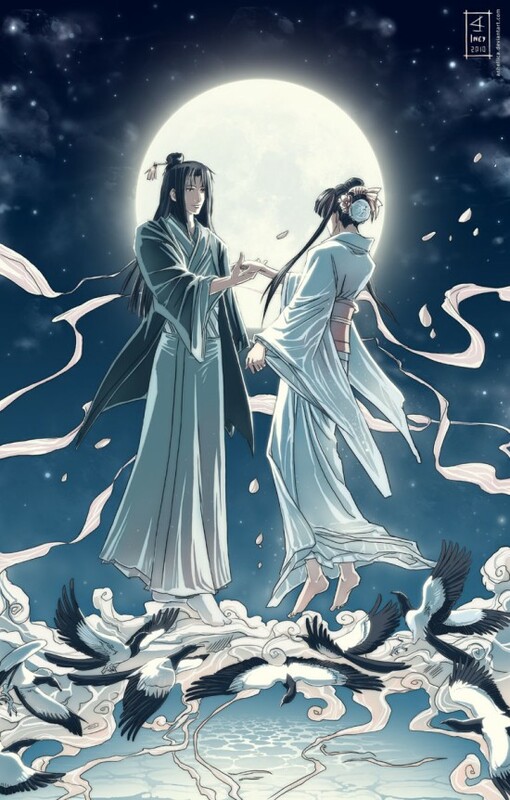 In China, the legend speaks of a forbidden romance between the goddess Zhinu – represented by Vega – and a humble farm boy, Niulang – represented by the star Altair. 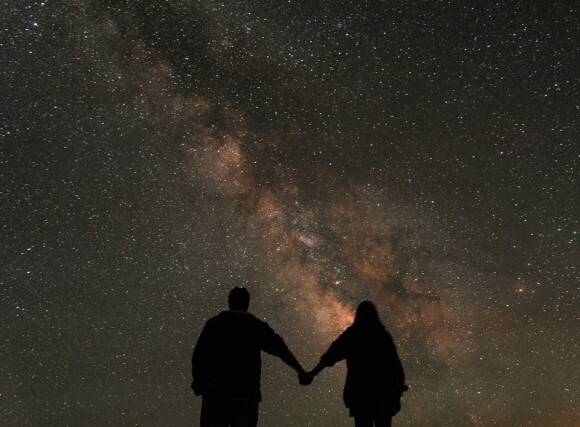 Separated in the night sky by the Milky Way, or Celestial River, the two lovers are allowed to meet only once a year. It’s said that meeting comes on the 7th night of the 7th moon, when a bridge of magpies forms across the Celestial River, and the two lovers are reunited. Their reunion marks the time of the Qixi Festival. In Japan, the festival is called Tanabata. Orihime and her lover Hikoboshi meet on a bridge of magpies across the Celestial River, each year on the 7th night of the 7th moon. Image via Anhellica/Lilliacerise’s blog. In Japan, Vega is called Orihime, a celestial princess or goddess. She falls in love with a mortal, Hikoboshi, represented by the star Altair. But when Orihime’s father finds out, he is enraged and forbids her to see this mere mortal. Then … you know the story. The two lovers are placed in the sky, separated by the Celestial River or Milky Way. Yet the sky gods are kind, and they reunite on the 7th night of the 7th moon each year. Sometimes Hikoboshi’s annual trip across the Celestial River is treacherous, though, and he doesn’t make it. In that case, Orihime’s tears form raindrops that fall over Japan. Many Japanese celebrations of Tanabata are held in July, but sometimes they are held in August. If it rains, the raindrops are thought to be Orihime’s tears because Hikoboshi could not meet her. Sometimes, the Perseid meteor shower is said to represent Orihime’s tears. How to see Vega. Observers in the Northern Hemisphere typically begin noticing Vega in the evening around May, when this star comes into view in the northeast in mid-evening. You can see Vega in very early evening by June – and high in the east by August evenings – high overhead on autumn evenings – in the northwestern quadrant of the sky on December evenings. Vega is easily recognizable for its brilliance and blue-white color. You can also easily pick out its constellation Lyra, which is small and compact, and consists primarily of Vega and four fainter stars in the form of a parallelogram. The little constellation Lyra has some interesting features. Near Vega is Epsilon Lyrae, the famed “double-double” star. Between the Gamma and Beta stars is the famous Ring Nebula, visible in small telescopes. Vega is one of three stars in an asterism – or noticeable star pattern – called the Summer Triangle in the early evening sky. The other two stars in the Triangle are Deneb and Altair. You can see the Summer Triangle in the evening beginning around June, through the end of each year. The constellation Lyra the Harp and its brightest star Vega. 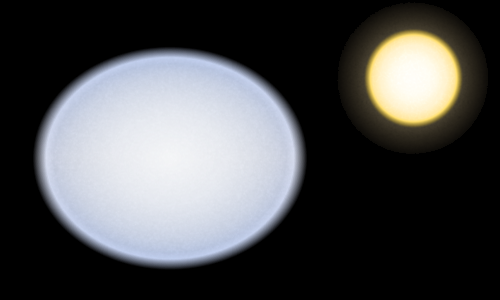 Size of star Vega in contrast to our sun. Image via RJHall at Wikimedia Commons. Vega science. Vega is the 5th brightest star visible from Earth, and the 3rd brightest easily visible from mid-northern latitudes, after Sirius and Arcturus. At about 25 light-years in distance, it is the 6th closest of all the bright stars, or 5th if you exclude Alpha Centauri, which is not easily visible from most of the Northern Hemisphere. Vega’s distinctly blue color indicates a surface temperature of nearly 17,000 degrees Fahrenheit (9,400 Celsius), making it about 7,000 degrees F (4,000 C) hotter than our sun. Roughly 2.5 times the diameter of the sun, and just less than that in mass, Vega’s internal pressures and temperatures are far greater than our sun, making it burn its fuel faster. This causes Vega to produce 35 to 40 times the energy of the sun, which in turn shortens its lifetime. At about 500 million years, Vega is already middle-aged. Currently it is only about a tenth the age of our sun, and will run out of fuel in another half-billion years. In astronomer-speak, Vega is an “A0V main sequence star.” The “A0” signifies its temperature, whereas the “V” is a measure of energy output (luminosity), indicating that Vega is a normal star (not a giant). “Main sequence” again testifies to the fact that it belongs in the category of normal stars, and that it produces energy through stable fusion of hydrogen into helium. With a visual magnitude (apparent brightness) of 0.03, Vega is only marginally dimmer than Arcturus, but with a distinctly different, cool-blue color. People around the world love the story of the star-crossed lovers, epitomized by the two stars Vega and Altair. EarthSky Facebook friend Shibuya Chang Zhang took this photo in Japan. 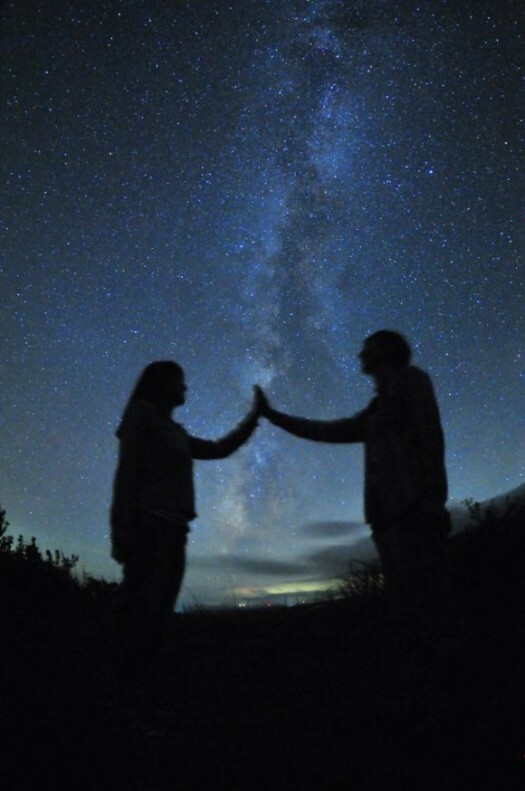 EarthSky Facebook friend KGS Photo captured the feeling of the story, too, with this photo from Grand Teton National Park in Wyoming. The blue-white star Vega via Fred Espenak. Used with permission. 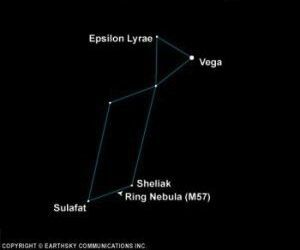 Bottom line: The star Vega in the constellation Lyra is one of the sky’s most beloved stars, for people around the world. 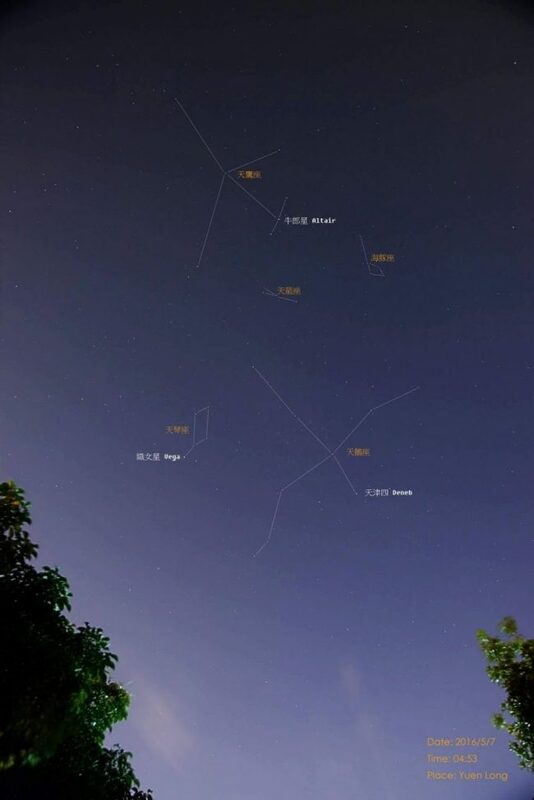 This beautiful blue-white star figures into the Qixi Festival, or Chinese Valentine’s Day. Vega’s position is RA: 18h 36m 56.3s, dec: +38° 47′ 1.3″.